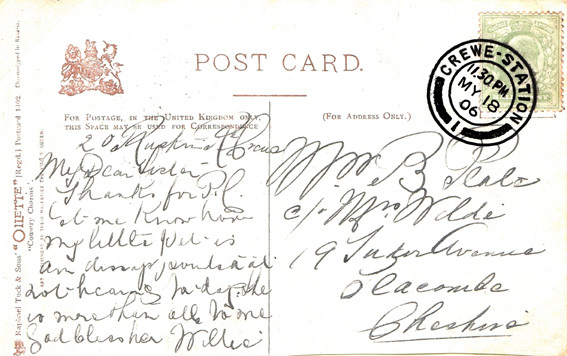 The first Crewe Post Office (not at the station) had opened in 1843. On 26 July 1854 this Post Office was split into two: a Crewe Town Post Office, and a new Crewe Station Post Office. The new Station Post Office was created to deal with the increased postal business at the station, and was put under the charge of John Matthews and his 5 members of staff. 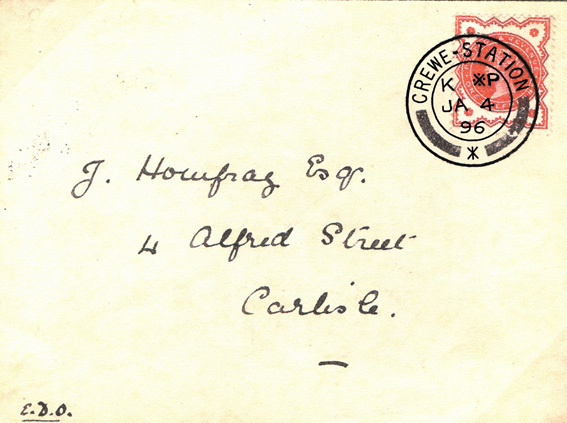 The postmark would include an hour code (to show the hour at which the item was posted) followed by a minutes code (to show how many minutes past the hour). This combined code was to be followed by a ‘dotted X’ (which simply separated the two codes from what followed) and either an A or a P (to indicate am or pm). Officially, the coded time system was phased out in 1895 and replaced by a time in clear system (viz. the actual time in numbers), but some post offices retained the coded time system until the 1900s. By referring to the above code list we can see that this postcard was posted at 10.00 pm (as there is no code for the minutes, the minutes value must be ’00’). 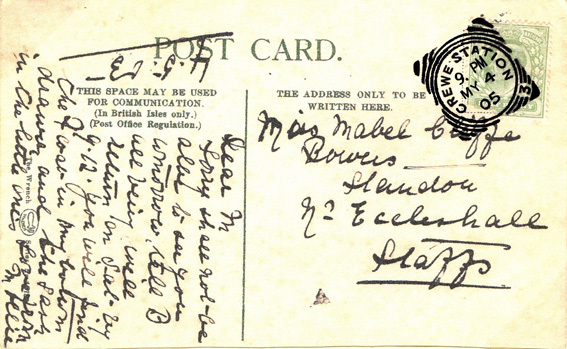 Also, we can see that the postmark is dated 1896 – after the coded time system should have been withdrawn. 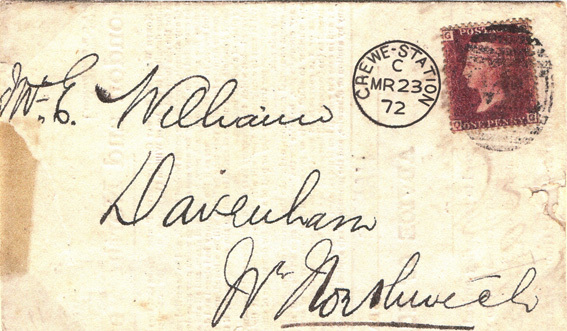 Also notice that the cross bars at the foot of the 1896 postmark are more ‘upright’, while the cross bars at the foot of the 1906 postmarks are more widely spaced . 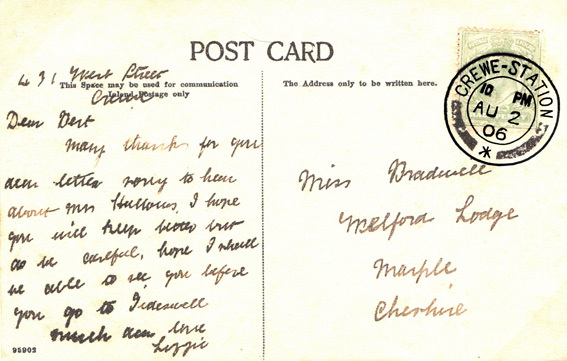 Here is another variety of Crewe Station double-ring postmarks. On this example the cross bars at the bottom have been replaced with a plain number I. Double ring cancels are known to have been used from 1896 to at least 1920. This variety is known to have been used from 1904 to at least 1907. From 1855 onwards, Railway companies also issued their own parcel stamps etc. The illustration below shows a strip of three nine-penny (9D) London & North Western Railway stamps cancelled (in mauve) at Crewe Station in 1909. Such cancellations were often unclear.